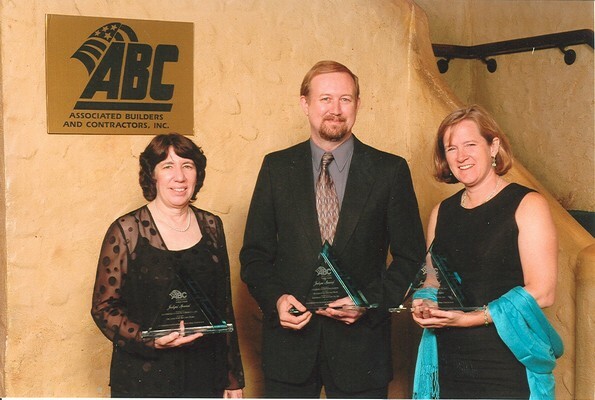 Architect Mary Ellen Jordan, President of Scearce Rudisel Architects, Kevin L. Berger, President of Easterday Construction Co., Inc. and Beth Stein, representing the Charlie Creek Foundation After accepting their Crystal Awards. Indianapolis, Indiana – Easterday Construction Co., Inc. of Culver, Indiana received the Judges’ Special Award, the top honor, at the 19th Annual Indiana Associated Builders & Contractors Construction Awards Banquet in Indianapolis on September 27th for the Dr. James Ford Historic Home in Wabash, Indiana. Over 500 people attended the event and over 150 awards were presented. Projects were selected by an outside panel of judges based on their constructability, uniqueness, overall impact of the project, and safety record. This project was submitted for consideration in the Historic Renovation category. Roger and Susan Thews and Kevin and Rebecca Berger represented Easterday Construction Co., Inc. at the event. Associated Builders & Contractors (ABC) is a national organization of merit shop contractors representing all construction trades. By receiving this award at the State level, Easterday Construction Co., Inc. is now eligible to submit this project to the national organization for consideration for an Excellence in Construction Award. The Dr. James Ford Historic Museum is a restored 1870’s Doctor’s Home and Practice. The project was begun as a renovation of Dr. Ford’s home by his grandson, Richard E. Ford, and the Charley Creek Foundation he founded. The home had passed out of the family’s possession and was divided into a duplex at the time of its purchase. The home was stripped and gutted taking care to preserve everything of historic value. This included stripping years of paint from the exterior brick, stripping years of paint from the interior woodwork, stripping existing wood floors and exploratory demolition to determine as much history of the additions to the home as possible. An elevator was installed providing access to all three floors and the basement. ADA accessible restrooms were added and blended into the displays. New wiring, HVAC, security systems, fire sprinkler systems and museum displays with electronics and sound were added and concealed with the structure. The home was then refurbished and redecorated to reflect its history. 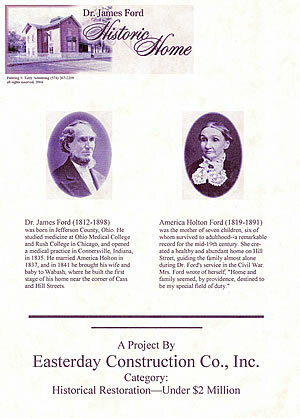 Dr. Ford was a surgeon in the Civil War and based his practice in his home. He was also an Architect. He was the Architect for the Christian Church catty-corner across the street. As his home evolved he duplicated some of the details that he used on the Church on his home. As part of the renovation, Easterdays restored many of these details. Easterdays oversaw relocation of the historic home next door so the Church could be seen from Dr. Ford’s study. One of the stories about Dr. Ford told of his returning deathly ill from the Civil War, but despite this, when the War ended he climbed to the widow’s walk and joined the celebration by firing his shotgun into the air. Easterdays rebuilt the widow’s walk. Dr. Ford came to Wabash with nearly nothing. He was a Doctor when much of the medical knowledge available was self-taught. His knowledge of architecture was also self-taught, but the depth of his understanding of construction is evidenced in the buildings he designed that are still in use, not the least of which is his historic home. His descendants continued his commitment to public service and were prominent members of the community up to and through the current generation. Dr. Ford and his family have been innovators and inventors throughout their lives. They hold various patents for ideas they have put into service. The Ford Meter Box Company is nationally known. It continues as a family business started by the descendants of Dr. Ford and is one of Wabash’s preeminent corporate citizens. The Dr. James Ford Historic Museum not only highlights the life of Dr. James Ford, but also gives a glimpse into the past history of Wabash. It is maintained as a period home, changing displays to reflect the season. Dr. Ford’s service in the military is highlighted showing what the Civil War meant to residents of Indiana. Not only is the home representative of the period, but the grounds have been planted with landscaping appropriate to the times. The grounds include kitchen gardens demonstrating the types of food that would have been grown there.